Ingredients: Horsetail, Peppermint, White Oak Bark, Cloves, Prickly Ash Bark, Bayberry Bark, Slippery Elm Bark & Stevia. With all the biting, gnashing & chewing our teeth do it's amazing how resilient they are. Still, the natural aging process takes a toll as adults often have weak tooth enamel, chipping, cavities, sensitivity, soreness & gum pain. 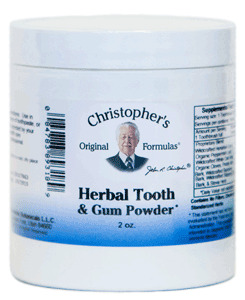 Dr. Christopher's Herbal Tooth & Gum Powder aids in strengthening the teeth & Gums.